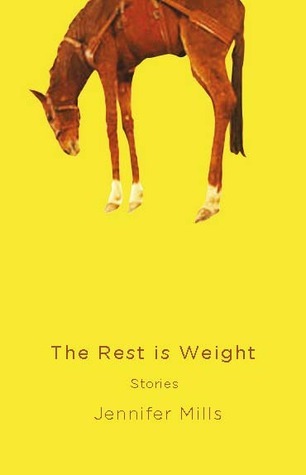 The Rest is Weight is a collection of short stories that explores the ordinary and the surreal, the search for human connection, the weight of loneliness, with a mix of wry humor and dark longing. Evoking a sense of place - the dry dusty outback of Australia, a Beijing street, these stories have diverse settings, Mills drawing on the places author Jennifer Mills has spent time in, including Mexico and Russian. There are twenty seven stories included in The Rest Is Weight, mostly around a half a dozen pages long. Some have been previously published but the majority are exclusive to this publication. I found all of the stories beautifully written, Mills demonstrates a wonderful facility with language, deftly conjuring time, place and personality. I was surprised at how easily Mills slips into to such a wide variety of characters, her protagonists are female and male, young and old, gay and straight yet they all convincing.While I enjoyed each of the stories, each very different from the others, a few did stand out for me. 'The capital of missing persons' has my favourite beginning "It used to be known as the murder capital of Australia, but these days Adelaide is the capital of missing persons. Are people getting better at hiding the bodies? Or are the victims leaving, deserting the city before the murderers have a chance?" (p52) I think Hello, Satan (p98)resonates with me because of the small town in which I live, where for some, a bargain with the devil may seem to be their only option to escape the cycle of poverty and dysfunction they are trapped in.Moth (p192) took my breath away and listening to Mills read it on her blog here gives it extra gravitas.Other favourites include The Milk in The Sky, The Opposite of Peace and Heat.The Rest is Weight is a remarkable read, the stories are literary yet accessible, and speak to a wide audience. This is a volume you can dip in and out of at will but I was compelled to read it cover to cover. As I don't often read short story collections and I will admit to initially being nervous about reviewing this book but I am pleased to say The Rest is Weight is easily one of the best collections of short stories by a single author I have ever read. For me this is an interesting, but uneven, collection of short stories. A couple blew me away and of the others, some impressed me and some didn't. There were a few stories that I felt were almost but not quite there and others I wanted to linger over. Mills is not afraid to experiment, and one thing I like about this collection is that some of the stories give the impression they could have been written by different authors. The opening story, Look Down With Me, holds the kind of horror that seeps into your bones, while in the middle of the collection, A Selfish Prayer is beautifully evocative of the pain of family love mixed with frustration. The Air You Need is a stunningly original story, and Heat is a simple story told with love. Other stories in the collection didn't work for me at all, however, they may be the stories that other readers love. There are definitely some gems in this collection, but the writing was not equally polished across all the stories, and in a few I got the feeling Mills was reaching to express something but just missing the mark. If you're a fan of short stories in all their wild variety, however, this is a collection worth picking up and dipping into, despite its flaws. Recommended. This is a great collection of short stories by a very capable young Australian author.